Background: Incorporation of polyoxometalates (POMs) inside mesoporous materials such as Metal Organic Frameworks (MOFs) is a common strategy to prepare highly dispersed active species useful for catalytic applications. Nevertheless, a systematic study of the POMs insertion especially in MIL-101(Cr), one of the most used MOFs, appears necessary to clarify the nature of the species really incorporated. Objectives: Effects of the structure, charge and size of the POMs on the nature of inserted ionic species, their maximum loading, and their interaction with the MOF framework are investigated. Methods: POMs with the same Keggin structure (13 Å) but different charges were used, i.e., [PMo12O40]3-, [SiMo12O40]3-, [PMo11VVO40]4-, [PMo11VIVO40]5- with various counter-ions like H+, Na+, NH4 + or TBA+. Other compounds known for their stability and larger dimension were also used, namely the Dawson-type [PMo18O62]6-, the Preyssler-type [P5W30O110]15-, and the macro-ring [P8W48O184]40- with diameters of 15, 18 and 24 Å, respectively. MIL-101(Cr), chromium(III) terephthalate, synthesized in presence or absence of fluorhydric acid was used. Impregnation of POMs was performed in presence of a large excess of POMs to determine the maximum loading, or in proportion of the maximum loading. All compounds have been characterized by elemental analysis, infrared (IR), UV-Visible, and 31P NMR spectroscopies, X-Ray powder diffraction and thermo-diffractometry, and thermogravimetry. Textural properties of modified materials were also characterized using N2 adsorption isotherms. The POM interaction with the MOF was also investigated by in situ IR spectroscopy studies monitoring the adsorption of CO probe and the potential transformations of POM incorporated inside the cavities were studied. Results: All types of the counter ions of POMs are not incorporated inside the MOF, [Cr3Fx(H2O)3- xO(bdc)3](NO3)(1-x).nH2O ((bdc = benzene-1,4-dicarboxylate, x << 1), either in aqueous or organic solvent. Incorporation of POMs within the cavities of MIL-101(Cr) occurs by ionic exchange with nitrate ions. The maximum of POMs loading per large cavity depends on their negative charge, but also on the steric limitation of the structure type of POM: 8 for Keggin one and 4 for Dawson one. Thermodiffraction reveals an increase of the thermal stability of POM@MIL-101(Cr) until 280°C versus 220°C for the parent empty MOF. The study of CO adsorption by in situ IR spectroscopy indicates that the Lewis acid sites of MIL-101(Cr) are blocked by nitrate ions and incorporation of POM increases slightly their access. Furthermore, no significant Brønsted acid sites were detected. Subsequent ionic exchange of incorporated POMs with Cl-, ClO4 -, and other POMs were also studied. 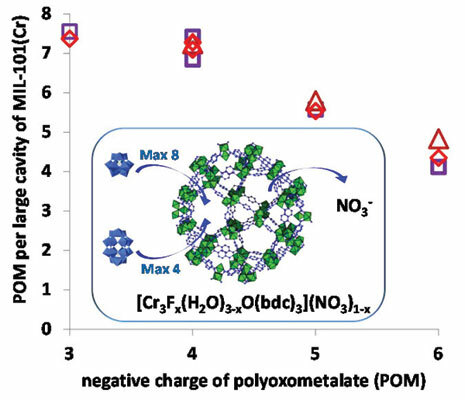 Finally, the pH stability of the MOF allows the partial hydrolysis of incorporated POM leading to unsaturated POM that can react with transition metal neutral complexes. Conclusion: No counter-ions of POMs are incorporated. Incorporation of POMs inside MIL-101(Cr) proceeds by ionic exchange. POMs thermally stabilize the MOF's framework and slightly increase the acess to Lewis acid sites. POMs can be removed by ionic exchange. We demonstrate that the host MIL- 101(Cr) behaves as a molecular reactor for the POMs chemistry. Keywords: MOF, MIL-101(Cr), POM, polyoxometalates, support, ionic exchange, Lewis acid sites, in situ IR study of CO adsorption. Keywords:MOF, MIL-101(Cr), POM, polyoxometalates, support, ionic exchange, Lewis acid sites, in situ IR study of CO adsorption. Abstract:Background: Incorporation of polyoxometalates (POMs) inside mesoporous materials such as Metal Organic Frameworks (MOFs) is a common strategy to prepare highly dispersed active species useful for catalytic applications. Nevertheless, a systematic study of the POMs insertion especially in MIL-101(Cr), one of the most used MOFs, appears necessary to clarify the nature of the species really incorporated.